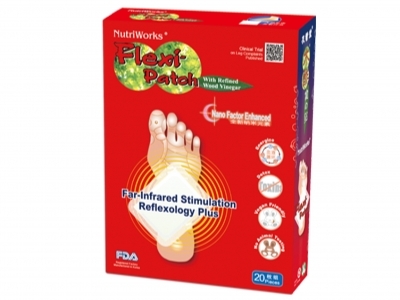 Flexi-Patch is your portable reflexology patch or “Detox Patch”. It’s great for muscle discomfort and whenever you are feeling tired and stressed and need a good night’s rest. Flexi-Patch combines ideas on reflexology, natural cleansing, traditional Chinese medicine, far infrared, use of poultices and crystal therapy. The concept of stimulating acupuncture points at the base of the feet, for example through foot reflexology massage, is well established. Stimulation of points along such meridians (an ancient Chinese concept) by use of needles or massage will, in turn, generate stimulus in other organs or body functions that are related to that meridian. Flexi-Patch utilizes the far-infrared (FIR) effect of certain materials to generate that stimulus. FIR has been researched for many years in relation to a wide variety of conditions such as muscle sprains, strains, peripheral vascular diseases, arthritis, shoulder stiffness, period pains etc. Many “functional fabrics” are now used in garments that also rely on FIR for improving circulation. The FIR effect may even help with people confined to a wheelchair and are therefore unable to exercise in the conventional way. Flexi-Patch is made of a fine pulverized form of purified Mandarin Wood Vinegar, nano-tourmaline and green tea. These patches may support healthy circulation and as a consequence promote cleansing internally through normal body channels. Flexi-Patch has a high absorptive capacity and long lasting effect during use. This product is excellent for muscular aches and pains resulting from long hours of work, exercise or due to conditions such as arthritis and gout. It may also benefit people who are stressed and unable to sleep or those with edema. Clinical research on far-infrared proved that Flexi-Patch can effectively promotion healthy blood circulation of the human body. Effect after 4 hours of use, showing significant improvement in circulation as evidenced by increased area of green / blue color in the photo. Clinical research on sleeping disorder proved that Flexi-Patch can effectively enhance the quality of sleep. An independent study on sleep disorder in London has shown that the use of Flexi-Patch for a period of 4 weeks has significantly increased the subjects’ average sleeping time and sleep quality by 50%! In a month, subjects with sleeping disorder on average improve by 24% on their quality of sleep. Clear reduction in the number of times sleep is interrupted; from 3-4 times to 1-2 times. Approximately 35% increase in time asleep. A clinical trial entitled “Is Patch-It® better than placebo in alleviating swelling and ache in the lower legs and feet? A randomized, placebo-controlled, double blind, crossover, sequential trial.” It was concluded that “Patch-It had greater efficacy than the placebo in alleviating recurring swelling and aching in the legs and feet, and is well tolerated.” You can read the trial report here. Place patch containing powder with printed side facing the sticky surface of the enclosed plaster sheet. Stretch plaster when applying to skin to ensure good adhesion. Apply patch to the soles of the feet before sleep. Keep patch on for 8-10 hours and remove patches in the morning. Clean the skin where patch was applied. For first time users: Wear on both feet for 7 consecutive nights. For health maintenance and detox program: Use every week, 2 to 3 nights a week. For aches, joint discomfort, sleeplessness and special needs: Cover the sole of each foot with up to three patches. Use every night until discomfort eases (safe for long term use), then switch to health maintenance program. For daytime use, apply patches on palms of hands and directly onto areas of discomfort until condition improves. Storage: Store in a cool dry place. Keep out of reach of children. Notes: Flexi-Patch may turn wet and a deeper brown colour after use. Note that because of its unique dual action, the patch is effective whether dry or wet after use. Warnings: For external use only. Do not use on wounds, damaged skin, eyes or mucous membranes or rashes. Ask your doctor before use if you have allergies, rash, itching or if excessive skin irritation occurs. Seek medical advice before use if you are pregnant.